Gecko's series of in.k600 keypads offers spa manufacturers a wide range of possible configurations, making our in.xm platform a perfect solution for mid-range to high-end and AV equipped spas. The in.k600 keypad offers a low profile configuration and enhanced durability. In.k600 can be customized with exclusive enclosure shapes. 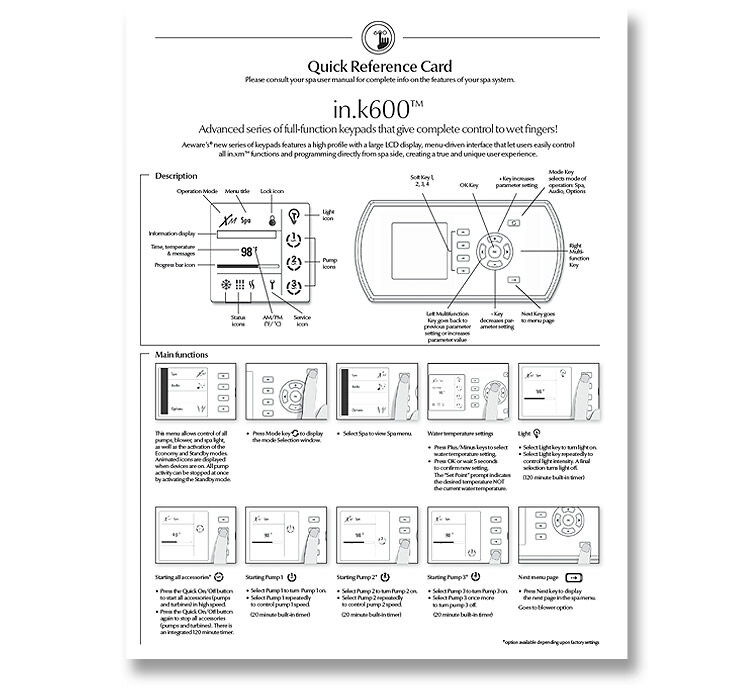 Creating a unique experience directly from your spa side, the in.k600 allows control of all functions and programming of the spa system and peripheral accessories. Built with a great design, the in.k600 features a large LCD display, a streamlined interface and raised keys for an easy control of all in.xm functions. With its low profile and a large LCD display, our streamlined interface keypad allows an easy control of all in.xm™ functions and programming, creating a true and unique experience directly from spa side. The menu-driven model controls all functions and programming of the spa system. The user can adjust the settings of peripheral accessories, creating a unique experience directly from the spa side.